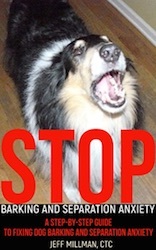 Purchase a Kindle EBook to stop barking and separation anxiety. Written by Jeff Millman. Watch the video and read the blog post to learn how to train your dog using positive reinforcement. Read Jeff's other blog posts from Chicago Paws Private Dog Training and Examiner.com. Jeff is the National Dog Training Examiner.